Early tech products either create trends and need, or pave the way for others to profit. Enstream, the joint venture launched by Rogers, Bell and Telus was created in 2012 to usher in a new payment process for wireless customers. The service was built to allow mobile users to easily purchase small ticket items from their NFC-enabled smartphone. At the time their consumer facing product was called Zoompass, which later transitioned into a broader product led by Rogers called Suretap. 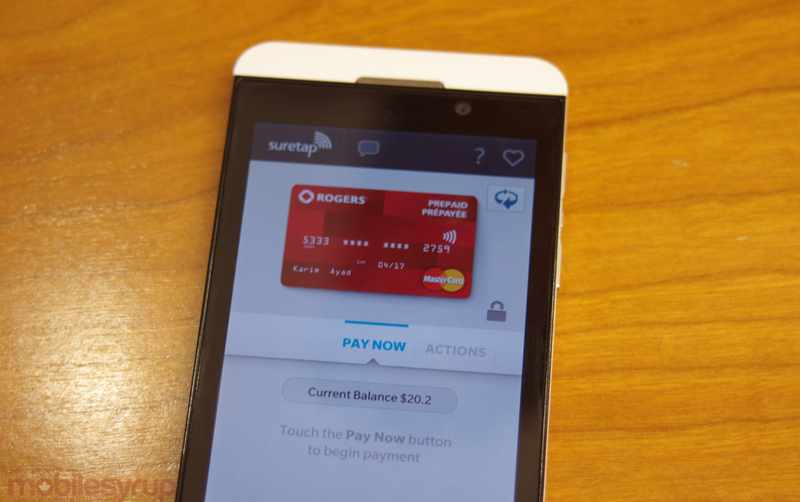 The application called Suretap Wallet was introduced in 2013 and was first used by Rogers customers, then made accessible to Bell, Telus, Koodo, and Virgin Mobile members in 2015. The Suretap Wallet application allowed wireless customers to store credit and loyalty card details within the app on their device which could then be used in retail stores to buy goods. Following its decision to shutter the joint MasterCard prepaid credit card program, Suretap has that its service will be discontinued on August 26th. “With ongoing changes in the market, and an increasing number of mobile payment and banking options available from CIBC, Desjardins, Scotiabank, as well as other wallets such as uGo, we at suretap, have decided that we will no longer offer suretap after August 26th, 2016,” says the platform’s website. While not mentioned on their site as reasons for discontinuing its service, Apple recently launched Apple Pay in Canada in May. The addition of Apple Pay might possibly have been the cause.